Two days before Christmas my 92 year old Grandmother passed away. So to honor her, I want to do 92 acts of kindness this January — one act of kindness for each year of her life. Even in times of sadness, or when I feel helpless, I find acts of kindness or volunteering empower me. Making a stranger’s day better reminds me that I do still have the power to improve the world. When you think about it, that’s an incredible power: That even on your worst day, no matter how rough things are, you have the ability to spread joy. And I’ve found that kindness is contagious. One act of kindness often leads to another, as people pay it forward. I want your help. I can do 92 acts of kindness alone, but I’d love to see others doing an act of kindness in her honor. I’d love to see the kindness ripple across the city. You have no idea how deeply sweet and emotional it is to see another person doing an act of kindness, a volunteer shift, or donating to a charity in her name. It helps me know her legacy lives on. Especially right here at Christmas. I’m preparing some acts of kindness, buying supplies and making plans. Whenever I do an act of kindness, I’ll leave a “Kindness Card” behind, which will explain the story and lead people to this website. If you do an act of kindness, please leave a comment below and tell me what you did! I’ll update this page frequently, adding to the list of accomplished good deeds until it reaches 92. So we can all see the progress and people joining in! I started tonight by buying 50% off Christmas candy and stuffed animals. I bought some “Kindness Cards” to leave behind, each which will briefly explain the story. My plan is to take this holiday candy, put it into a few holiday bags with cardinals on them (my Grandmother loved cardinals), and give them out in drive-thru windows! I think I’ll visit Starbucks tomorrow. Here’s what’s been done so far! If you do an act of kindness, please leave a comment, and I’ll add it to the list! Goal: 92 Acts of Kindness by the end of January! So Far: 78 Acts of Kindness Achieved! I paid for the car behind me at Starbucks. The woman in the drive-thru seemed moved. I drove thru at the Wendy’s on Maynard. Surprised the woman in the window with a whole bunch of chocolate! I donated money an organization which helps women with medical expenses. Ben’s Bells, an organization that does random acts of kindness in Arizona, hung a beautiful bell in a tree with Grandma’s name, Lucille Alexander. Mary Lou – I just donated 2 bags of dog food, 3 bags of dog treats and a cage to the local animal rescue Capital Area Rescue Effort in VA in honor of Lucille and your 92 acts of kindness. I think you both would like it. Leslie – I do volunteer work at 12 Baskets Cafe: a program of Asheville Poverty Initiative. Today’s shift is dedicated to your grandmother. Kim – I made a donation to Little Raleigh Radio and hope others do the same! Elaine – I donated $57 to Meals on Wheels today. Clara – I donated linens to the Raleigh Rescue Mission today! Susan – Made a donation of $5.00 in your grandmother’s name to help a family do random acts of kindness by giving away books to kids in need. Debb – I paid for the groceries of the elderly lady in front of me at the Food Lion on Battlebridge Rd in Raleigh. I also gave her several cans of catfood for her cat Willie. We hugged and shared an emotional moment. Janelle – I gave two movie tickets to a single father and his daughter. Bob – I played secret social media santa for a worthy cause. CapBlack (Real Life Superhero) – Donated $25 to help me do more good deeds for Grandma. Very unexpected! Wow, thank you! Mary – I gave an elderly woman who was living outside money for a night in a hotel. Wish I could have done more. Therese donated dozens of hand-made Kindness Rocks, affirmations, and signs to help spread kindness! Marta – I made a donation to the Claire Parker Foundation Inc, an organization that provides supplies and support to families dealing with pediatric cancer. Rose – I welcomed 2018 by passing along a set of Hot Hands to a parking lot attendant at PNC Arena. They were 18-hour warmers with many hours left to go, and this fella’s shift was nowhere near over. Someone has warm hands during his shift tonight, and your sweet grandmother is remembered & surely smiling as he was as I passed them from my hands to his. I left an extra large tip and Thank You card for my server at the Ale House. I left a $10 Barnes and Noble gift card on a table, along with a kindness note, for someone to find and use. 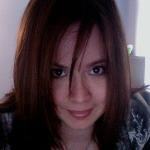 Sarah – I made a donation to a man sleeping in his car with his dog in RI. No shelter would take him with his dog, so people were getting him a room till the really told weather passes or he can find something better. I thought of your grandma when I did that. It was very spur-of-the-moment! Maryam – I made a donation to a charity with your grandma in my mind! Karen – On New Year’s Eve day – myself, my husband, another couple, and a woman and her child all came together (previously strangers) and brought food, drinks, snacks, and friendliness to feed the homeless/needy in downtown Raleigh – I kept your grandmother in mind with us that day. I Paid $50 for “suspended coffees,” so anyone who came into the cafe after me could get their coffee for free! Huge thanks to Jubala Coffee for getting involved! ABC11 WTVD came out to cover this act of kindness, and I will link to their story as soon as it’s live! I Bought delicious treats from the Chocolate Boutique in Lafayette Village to give to the workers at Jubala! Anonymous – Bought $50 gift card for Panera, and left it for whoever comes in after me. Tothian – I sent $20 to a friend, who is homeless and has not eaten in a day, and would not have much food until Friday. Ryan – Donating a space heater to a mother and her kids, who are without heat for the Winter. The Facebook group Carolina Cares has several families seeking space heaters, or even items like coats and scarves. It’s a great group to find a local family that needs something simple, and provide it directly to the family in need. And seriously — thinking of a family and kids being kept warm all Winter in memory of my Grandma … that’s beyond wonderful. Captain Black – Promoting and sharing acts of kindness. Kerry – Preparing a homemade meal for a grieving family. Patjos on Kindspring – (All the way from Scotland!) On my way home from work I decided that instead of giving my change to a homeless person in the street, I would give a paper note instead, in memory of your Gran. I almost didn’t and walked past, but went back and shook hands, said ‘Hello’ and passed him the money. (Note from author: If you want to meet an amazing kindness community, check out Kindspring). Jane – Today, in honor of your Grandmother, I bought a traveler container of Starbucks and left it with the Cost Co tire crew. I was there the day before and noticed how insanely busy they were. When I saw your story, I decided to contribute a Lucille act and told them the story you posted. They were grateful, surprised and happy to start the day out with a cup of coffee and a smile – maybe they will continue to pass on small acts in her honor. Jay – I started a charity campaign called 5s for 5-0 in which I am buying a few $5 gift cards, and when I see an officer, I hand them one thanking them for all they do, protecting us and putting their lives on the line. I’ve given out two this week. Diane – Made a donation to Gentle Barn (farm sanctuary). Diane – Made another donation to the Healing Place of Wake County. Diane – Made a third donation to Dreamcoat ministries, in Knightdale. They help local folks who have gone through tragedies. Amber – Brought cocoa and hand-warmers to the first responders and helpers at the scene of a fire near her home. Wow! Brady the dog, a recipient of a random act of kindness and treats! kindness for Grandma. Thank you so much! You’re a perfect example of how kindness connects people and, by being kind, you allow more people to be kind, and create a ripple effect. I met a big, fluffy, sweetheart golden doodle named Brady at Unleashed in City Market. I got permission from his owner and bought him a treat! He seemed to love it. 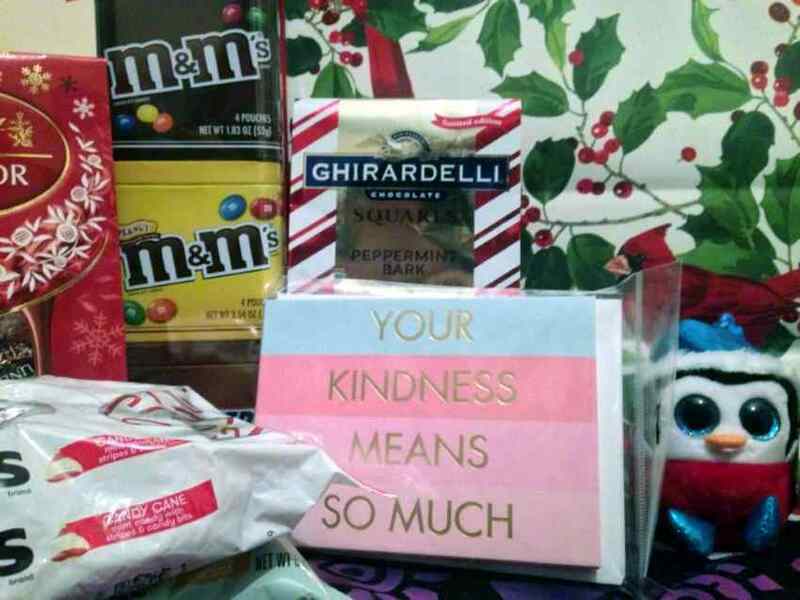 I left a small bag of goodies for Therese when I went to pick up the kindness supplies she was gifting to me. I left a small stuffed penguin and kindness card on someone’s car door. I left a little gift bag with a hand-painted kindness rock, a $5 Starbucks gift card, and a kindness card on a car door. I paid for the car behind me at Starbucks. I saw the woman through the windshield make a surprised and happy face! I left a hand-painted kindness rock encouraging the finder to “Pay it Forward” on a Starbucks table. Ben’s Bells Project in Arizona donated an act of kindness to Grandma! They do acts of kindness already, hanging hand-made bells of kindness on trees around their city. These bells were hung in Grandma’s honor, with her name dedicated on the card! Lara – Just left a $25 gift card to a restaurant for a mom who seemed to be having a rough day! I wish I could have left her a gas card, but I hope this helps her all the same. Gailyn – I paid for groceries of a single mother with two children. Isela – I paid for the gentleman behind me at Starbucks and said a little prayer for your family. Shannon – Gave a frail, older gentleman a ride 3 miles to his destination, then offered to buy him food. He just wanted $1 for oatmeal. Terry – Surprised a nearby table by paying for their meal at a restaurant! Jan – Creating care kits for people who are homeless, stuffed with warm socks, T-shirt, beanie, gloves, snacks, and anything else she can think of that they need. Debby – Sent a friend who fell in the ice — chocolate, cookies, and an ice pack! 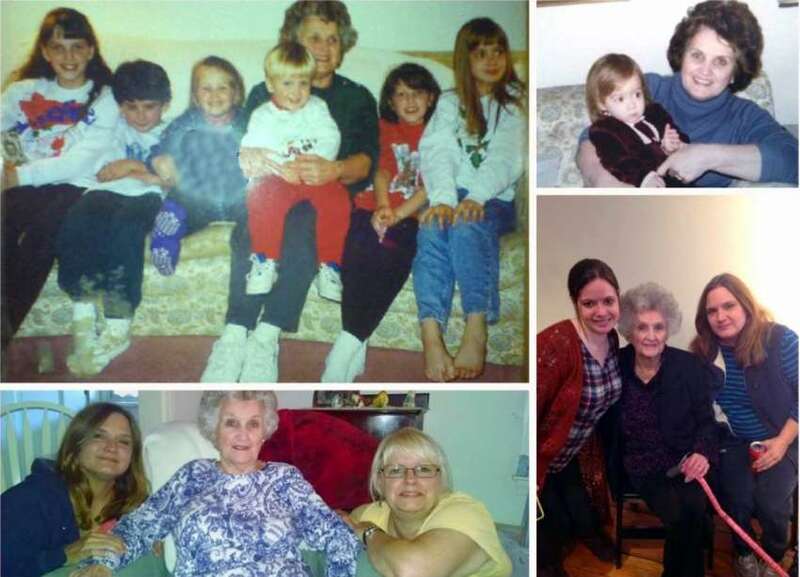 CapBlack – Donated Dollar Super Power donations in honor of your Grandmother. Dorri – Played piano for the residents of a senior living facility. Leslie – Brought a healthy snack of fresh veggies and dip to surprise co-workers. Grace – Donated a surprise gift card to her co-worker. Anonymous – Gave mechanic hand warmers and soup on a cold workday. Anonymous – Showed someone how to make Kindness Rocks! Anonymous – Mailed Cards to women for encouragement. Anonymous – Provided encouraging quotes to clients. Mish – Dedicating the gift of a Prayer Shawl, which I like to call a “hug,” that I am currently crocheting to gift someone who has been facing big health challenges for many years. I hid Kindness Rocks at McDonalds near my house. Doyle – Found a random act of kindness dedicated to my Grandmother, and they took a photo and told me about it. They found a Ben’s Bells Project bell, a handmade bell hanging in the trees in Arizona, that has my Grandmother’s name on it. Doyle contacted me to let me know they’d found it, and now the beautiful handmade bell with Lucille Alexander’s name on it is hanging in someone’s lovely garden in Arizona. Valory – Hiding Ben’s Bells around the Triangle area with her son. Keep a look out and see if you’ll find one! Courtney – A friend I only know online was talking about struggling to pay bills after the holidays, so I sent $20 to help make the burden a little easier. Lara – Made three days worth of crock pot meals for a family who is having a really hard time. I hid kindness rocks around a shopping center. CapBlack – Donated Dollar Super Power donation in honor of your Grandmother. Anonymous, non-disclosed act of kindness. A prayer shawl made for a friend in need of comfort. Mish – Created a handmade prayer-shawl for a friend in need of comfort. … Working on 14 more Acts of Kindness! Lucille Belle Riggsbee Alexander. She was born and raised in Raleigh. She remembers when horse and wagons were still in downtown. She told me so many stories about the history of Raleigh. Grandma, I don’t know what happens when someone passes on, but I hope where ever you are, you see these acts of kindness happening across your home city. I hope it makes you smile. And even when these 92 acts are completed, I hope you know that every act of kindness I do from now on — you’ll be on my mind and in my heart. You raised me.